*You can omit the other spices if you are having trouble finding them but do not skip these. These really give it that authentic Phở taste. Thoroughly wash and clean the beef bones and parboil on high heat for 1 1/2 hours or until all the blood has been cooked out. Dump the pot and rinse the bones. Put all the spices (in a mesh bag), onions, ginger, and the beef bones into a clean pot and fill with cold water. Simmer in low to medium heat without allowing the water to boil for 2 hours. The low simmer will keep the color of the broth light and clear. Add fish sauce and sugar in small amounts and taste the broth so you can adjust the seasonings. Simmer for another 2 hours. When ready to serve, bring beef broth to a boil. Prepare the rice noodles according to the manufacturer's instructions and place in a large bowl. 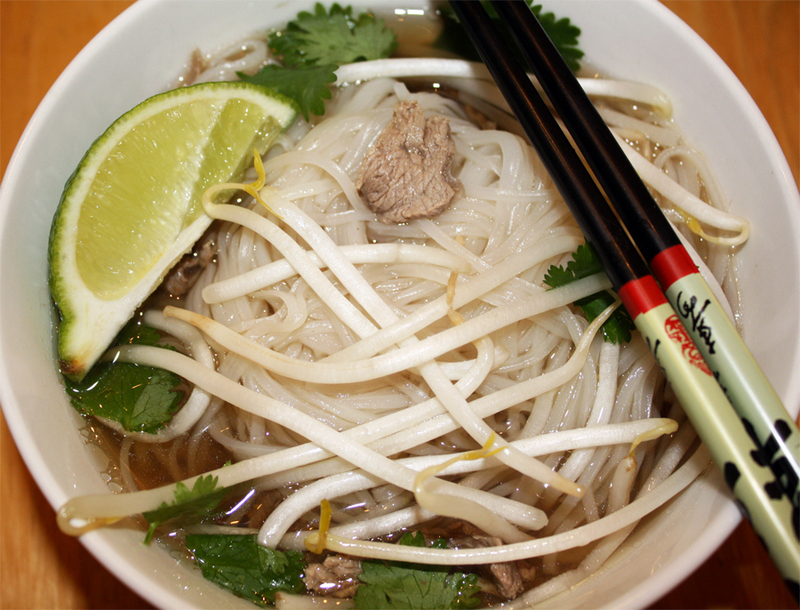 Pour steaming hot broth over the rice noodles and add your choices of meat*. Garnish with as much or as little fresh herbs and condiments as you like. 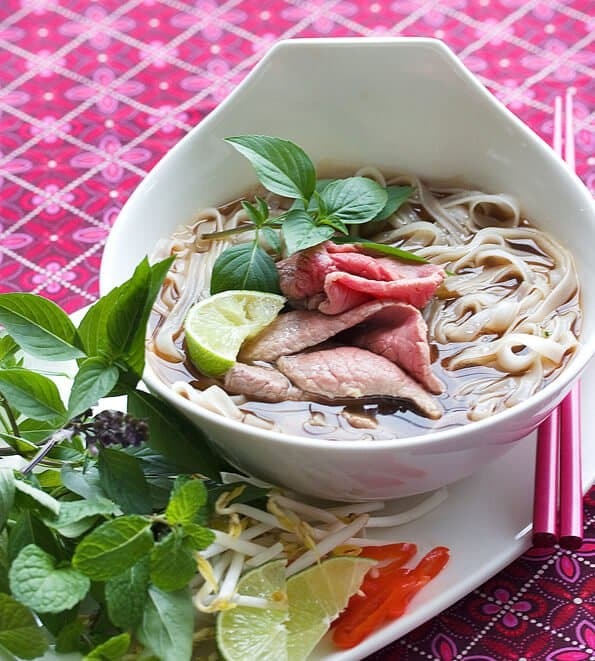 *The thinly sliced beef steak will cook with the heat of the broth. However, if you prefer to cook the meat completely, boil the meat in a small amount of the broth in a separate pot. and a squirt of lime but I could only find rare beef steak this time. It is usually served in a big bowl but all of my bowls are either small or REALLY big. I also had to sliced the meat myself so the meat doesn't look/taste like the traditional Phở. oh yum. I am now craving Pho! If you were nearby I would invite myself over for some. 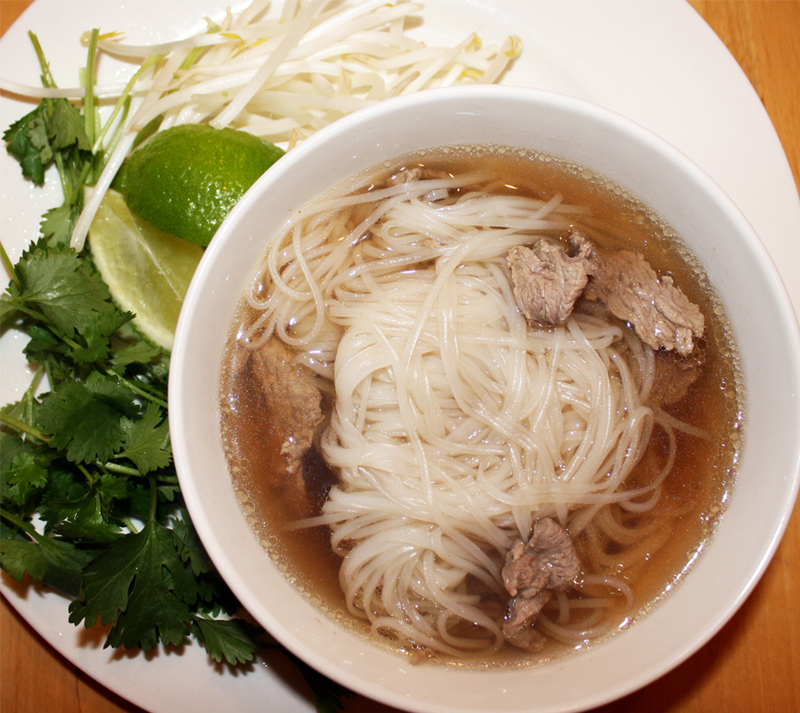 I love Pho. I could eat it for any meal and in between too! I have found a place here that has some good Pho. My only problem is that I'm used to just asking for Pho Bo and not specifying what kind of beef...I just ate what they gave me! I've thought about trying to make it from time to time and just haven't yet. Someday!